I have heard of Gerber multitools before and I bet a lot of you have too. They are cool little gadgets for sure. The things have these cool little tools inside and are a lot like Swiss army knives only they aren’t Swiss. Gerber has a new multitool that will be coming next year that is really cool. It has a tripod screw mount inside that pops up and will attach to the bottom of most cameras. On the bottom grip of the tool are a couple flip down gray handles that act as legs to support the camera when in tripod mode. 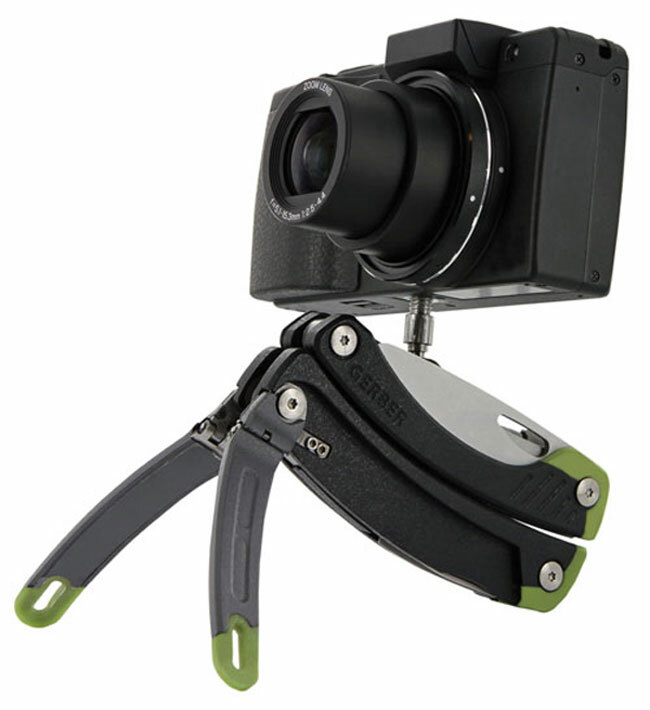 I’m not sure how much weight the multitool can support, but I would bet its best for smaller cameras rather than the big DSLRs out there. The Steady will ship in 2012 for $65 and has a total of 12 implements. I see a knife blade, but the other tools are unknown. I am sure it includes pliers and some screw driver blades though.